Takeaway: Corrosion can greatly decrease the shear strength of construction materials. Care should always be taken when designing and maintaining structures that can or have suffered corrosion damage. Shear strength is a material property analogous to the ultimate tensile strength (UTS), with the key difference being in the plane in which the strain acts. It is still a function of stress, but the strain is parallel to the face of an element (or a cross-section), whereas it is perpendicular in the case of the tensile strain. In essence, we have two surfaces that are sliding relative to each other, instead of being pulled apart or compressed. Unlike compressive and tensile strength, which are fairly straightforward concepts, shear deformation is a bit harder to mathematically define. 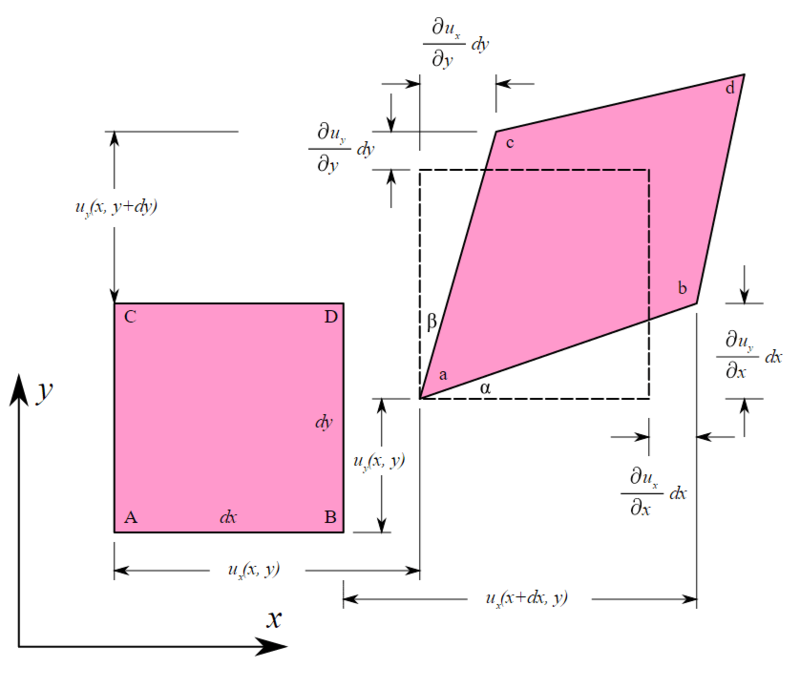 The engineering shear strain is defined by the angle of deformation γxy, which is the sum of the angles α and β that represent the displacement of the face in question in two possible directions. In the case shown in the picture, the angles α and β show the relative change in the position of lines AB and AC, respectively. where G is a shear modulus of the material. Even with the straightforward equation, due to the nature of the strain it is fairly difficult for us to obtain the needed parameters from the real world without experimental results. Luckily, we can still find experimental values for shear strength with relative ease, and it turns out that for most modern construction materials the relationship between shear and tensile strength is fairly linear; therefore we can skip a few steps and estimate the shear strength directly using rough estimates that range between 0.65 and 1.3 of the tensile strength value for the majority of construction materials. As a rule of thumb, ductile materials such as aluminum more often fail in shear (the shear strength of aluminum is 0.65 of its UTS), while brittle materials more often fail in tension. One of the main problems that civil engineers currently face is corrosion of the steel reinforcements found in almost all aging structures, with bridges being one of the most problematic cases. (See more about the challenges facing bridges and other infrastructure in Public Institutions' Corrosion Prevention Efforts Leave a Lot to Be Desired.) Naturally, this is one of the reasons why most tests have been done on specimens derived from the rebars. While there has been some work done on establishing the relationship between the level of corrosion and the tensile strength of material, only recently have there been experiments conducted specifically to establish the effect of corrosion on the shear strength of the reinforcing bars and steel fibers. One of the main roles of the rebars in concrete is to increase the shear strength of the beam, so it is only natural that most recent shear strength testing has been done for cases where rebars or steel fibers are used to strengthen a concrete element or structure. From this and other experiments and research, it was evident that the steel fibers increase the shear strength of the concrete member. If an individual fiber suffered less than 12.5% corrosion of the minimum diameter, the effect on the shear capacity of the beam was negligible. Since the research focused on the specimens with corrosion near the crack or on the surface, it would be safe to assume that the behavior of such a corroded member would have the same performance as the non-corroded specimen. If the corrosion was allowed to act further and decrease the diameter of the steel fiber by 50%, the effect on the shear capacity could be felt in the form of a 24% reduction in shear strength. However, this extreme case of corrosion is very unlikely to occur in a real world case, where surface and near-crack corrosion usually occurs. Another conclusion from the study was that for a limited level of corrosion, there is an increased bond and friction between the steel fiber and the concrete matrix, caused by the corrosion on the surface. However, at higher levels of corrosion, the effect is negated as the corrosion stops being uniform and these localized pits cause a change in the fiber geometry and can lead to the breaking of the fiber. This non-uniform corrosion is believed to be the cause of the significant reduction of the material's strength and ductility. (For more on this topic, see the article Effect of Corrosion on a Material's Tensile Strength and Ductility). The results of the test showed that there is a greater reduction in the toughness and ductility than the shear strength, for the same corrosion levels. These results for steel fibers might not be representative though, as fiber reinforced concrete is not widely used compared to the more common rebar concrete. The corrosion led to a relatively uniform loss of mass in the stirrups, but the loss varied greatly between the specimens. All specimens showed signs of corrosion cracking and loss of contact with the concrete cover. Most importantly, their results showed that all specimens showed a reduction in shear strength of up to 53%, with the specimens having the lowest shear span-to-depth ratio showing the greatest reduction. Initiation of diagonal cracks for the beams with a shear span-to-depth ratio of 1.5 and 2.0 was slightly reduced, but the corroded stirrups were less able to hold the crack propagation after the initiation. While the effects of corrosion vary based on the type of element in question, it is indubitable that corrosion can greatly decrease the shear strength of the material, and that care should always be taken when designing and maintaining structures that can or have suffered corrosion damage.